Naloxone (more commonly know by the brandname Narcan) is a medication that temporarily reverses the effects of opioids and opiates. The medication is delivered either through injection or intra-nasal spray. In 2018, the province of New Brunswick began supplying AIDS New Brunswick, Avenue B (formerly AIDS Said John), and Ensemble (formerly AIDS Moncton) with naloxone kits to distribute to persons at risk of overdosing, and their family and friends. Call 911, or your local emergency number, immediately. Follow the instructions of the operator. 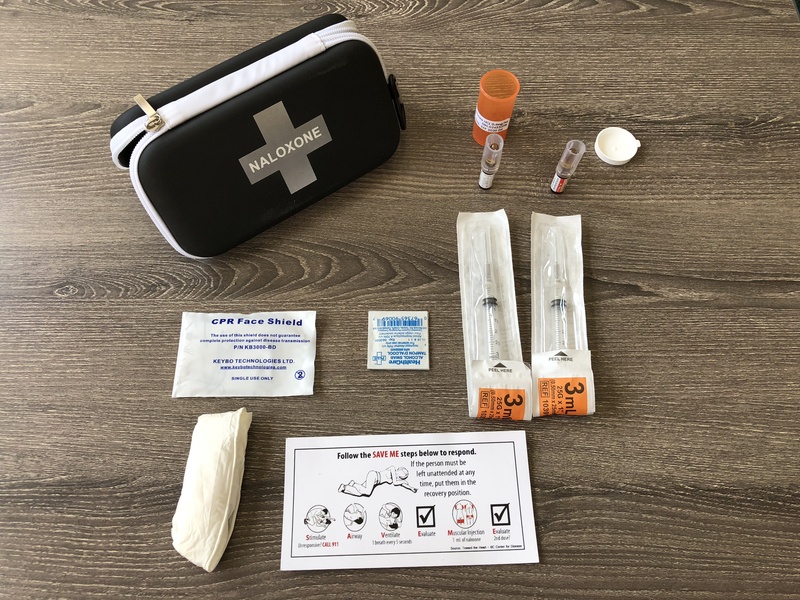 Give naloxone – follow the training, and instructions in the kit. Online training is available through Toward The Heart’s Take Home Naloxone program. Once you complete the training you will be given a certificate to print or keep electronically. You will be asked to present this certificate in order to receive your naloxone kit. You may contact one of the locations below to learn more. You may take your certificate to either of AIDS New Brunswick’s offices, Avenue B or Ensemble to pickup a free kit. Many pharmacies have kits for sale. Please consult with your local pharmacy for availability and associated cost. The kits provided by AIDS New Brunswick, Avenue B, and Ensemble are equipped with VanishPoint Syringes. This means that once the syringes has been used the needle retracts into the barrel of the syringe significantly decreasing the risk of a needle stick injury. If the kit was provided by AIDS New Brunswick, Avenue B, or Ensemble, then simply return to the location you received the kit from to have it replaced free of charge. Please bring your used kit with you along with any of its contents, used or unused, and we will dispose of the contents properly. Even if you only used 1 of the 2 vials of naloxone you must return to location where you received your kit so that we are able to provide you with a new complete kit. It is important the the kit be fully stocked at all times. Naloxone does expire. The expiration date is printed on both the naloxone case and on each of the naloxone vials inside. Most naloxone kits will last for approximately two years before they expire, but this may vary depending on a number of factors. If your kit has expired you may return it to AIDS New Brunswick, Avenue B, or Ensemble to exchange it for a new kit. If your kit was lost of stolen you may return to the location where you initially received the kit to receive a replacement kit. Please keep in mind that each one of these kits has the ability to save someones life. Naloxone needs to avoid extreme temperature. Do not store your kit in extreme hot or cold locations such as a glove compartment. Extreme temperature may cause the naloxone to lose its effectiveness.